What an amazing story! Firelight hadn’t caught my attention at first, but after one of my readers suggested I read the novella (which I haven’t yet, sorry!) and I noticed the cover of the second book, Moonglow, I saw Firelight under a new light and decided to give it a try since it was available on NetGalley. Boy, I was not disappointed! Firelight is a breathtaking gothic twist of The Beauty and The Beast’s story. I hadn’t realized when I picked the book that it was a retell from this classic, my favorite Disney movie growing up, so I was happily surprised when I started noticing the similarities. Callihan’s writing is simply fabulous, infusing credibility to this historic setup. 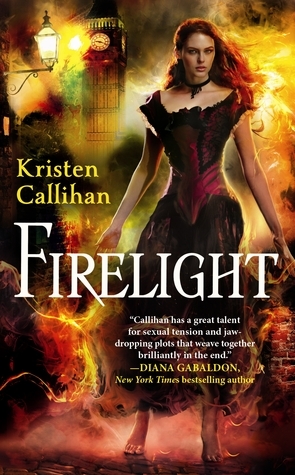 Written in old English style and respecting the old traditions and morals, Firelight shines by its authenticity and I loved every second of my reading experience. The character’s speech is on par with the era and I truly enjoyed verbal fencing Miranda and Archer nurtured during the whole novel. Miri might be a lady, but her vocabulary is as colorful as one of a man of this period, it was highly entertaining. Kristen chose to narrate her story in third person and even though I’m a fan of first person narration, it worked perfectly for this story. The author’s writing style allowed the readers to feel very close to the main characters despite the narration form, all the while letting us in on all the characters’ feelings. I really enjoyed both Miranda’s & Archer’s point of view, I honestly couldn’t choose a favorite. Character wise, Callihan really hit the bull’s eye. Miranda is fierce, strong and protective even though she has a low self-esteem. Her past is making it hard to overcome her differences and her slow progression was believable. Her attraction, then love for Archer were a treat to witness and I loved every moment. Archer is so deep in his self-hatred that he is completely blind to Miranda’s affections. He might technically be a monster (and we won’t know his very nature until the end) and married Miranda for selfish reasons, but his love for her is pure. I really loved the guy! The atmosphere and the romance were my favorite aspects, but Firelight also has a strong mystery fiber. Someone is murdering Archer’s friends, mailing him body part to bait him. Miranda, wannabe spy that she is, tries to identify the murdered to protect her husband, but Archer is doing his very best to keep her out of arms way, thus withholding information from her. With a killer on the loose and Archer’s nature a secret, room is open for a lot of speculation while reading and I’m grateful I didn’t manage to guess neither until Callihan was ready to enlighten us. Kristen Callihan’s debut novel is definitely a must read! Firelight’s fast pace, engaging story and amazing characters will enthrall you from the start, and keep you glued to your book. I am anxious to get my hands on the second Darkest London book and I’m glad I only have a couple of months to wait! This sounds like an amazing book that combines my two favorite genres and I hadn't heard of it before! Thanks so much for reviewing it! Great review. I absolutely loved this books. One of my favorite reads of the year so far. Nice review Tynga, this book is on my wishlist.